Finely slice pork and add to a bowl with salt, peanut oil, some cornstarch, and some water. Let marinate for approx. 10 min. Soak dried mushrooms in a bowl with warm water for approx. 5 – 10 min. Finely slice red pepper, bamboo shoots, and soaked mushrooms. Chop garlic, ginger, and scallions. For the sauce, add light soy sauce, dark rice vinegar, sesame oil, sugar, and rice wine to a small bowl and stir until combined. Mix remaining corn starch and water in a separate small bowl. 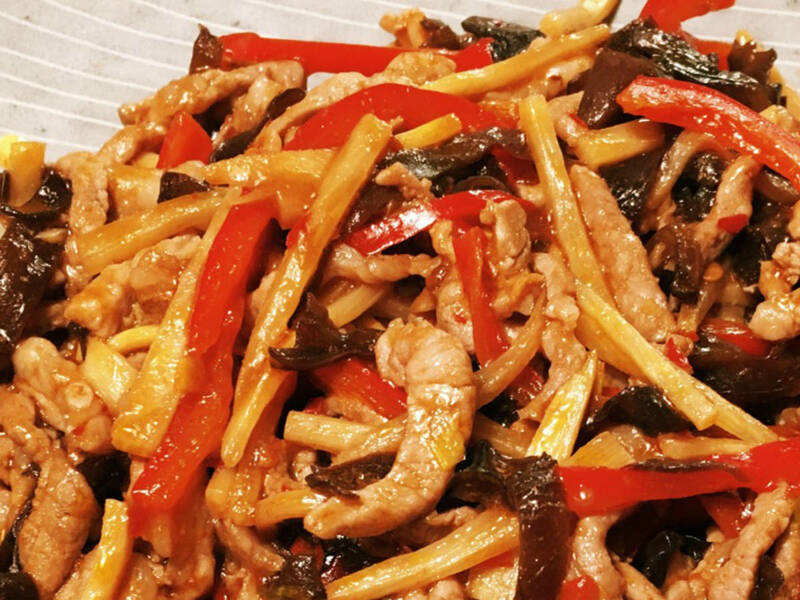 Heat vegetable oil in a frying pan over medium heat and fry sliced pork until white, then set aside. Remove pork from the pan, then sauté garlic and ginger until fragrant. Add chili paste and fry until the red oil comes out. Add red bell pepper, mushroom and bamboo shoots, and fry over medium-high heat for approx. 2 – 3 min. Add the pork neck to the frying pan along with the sauce and the corn starch mixture and fry until you’ve reached the desired consistency. Serve stir-fried pork with rice and sprinkle scallions on top. Enjoy!